Superior Basement Systems is your locally owned and operated Total Basement Finishing™ contractor in the Ohio area. In operation since 1991, we proudly serve Dover, Millersburg, Saint Clairsville, Graysville, Marshallville, Burbank, Clinton and the surrounding areas. 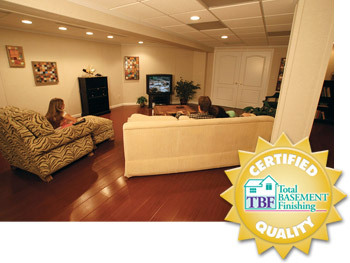 The Total Basement Finishing™ System is a complete basement renovation package. This means that you can count on us as your one-stop remodeling source -- including the walls, floors, ceiling, windows, lighting, electrical -- anything you need! If that doesn't suit you, you can create a home office, children's play area, basement bar, home gym... anything you can imagine is possible through Superior Basement Systems and Total Basement Finishing™! If you're interested in planning and pricing for your remodeling project, Superior Basement Systems can help. We would like to offer you a free basement design quote at no obligation. At Superior Basement Systems, our mission is to provide you with responsible basement finishing, at a fair price, while providing the best customer service in the contractor industry. Call or e-mail us today for your free basement finishing quote! Bring YOUR space from Basement to Beautiful in no time at all! John Shrock came to my house in person and explained everything in great detail. I was impressed with the professionalism of everyone I dealt with.